Taking on complicated home improvement projects can be overwhelming. We have every detail covered from concept to completion. Your Transitions team includes a designer to guide you from start to finish, a project manager to estimate and oversee your project, and our experienced construction team to complete every detail. Work scheduled is sent to client for approval. Access, keys, dumpster placement, space preparation and any concerns are discussed. Your Transitions Project Manager will meet you at your home the morning we start and review the scope of work with the demo crew. The crew will section off the work area and tarp a path to exit the home. The dumpster will be placed on plywood blocks to protect your driveway. We’ll make sure the space and your home will be clean at the end of the day. As work continues, the work-space will be kept clean and organized. Dust protection and tarps will be used cover floors and section off the work area from the rest of your home. Transitions will need access to the home during normal business hours. Your Transitions Project Manager needs to be able to stop in to check work, meet inspectors, review work with the plumber, electrician, etc. Many of these items cannot be scheduled in advance and require a key to be placed in a lock box for access. We will call, text or email prior, if desired, but need to be allowed to work when needed. Transitions will work to keep the project on schedule. We try to work in your home each day, but we may have a day or two in between where no one is working at your home. It is difficult to estimate exactly how long each phase of a project will take and we build in an extra day or two to allow for delays. Punch Lists and Change Orders: Lists and Changes are best handled by email so we have written documentation. The Project Manager is available to meet with you and review any questions or concerns and is accessible by email and cell phone. Weekly meetings are encouraged but emailed lists are adequate for good communication. Please reach out if anything appears to be different from your expectation so it can be addressed in a timely fashion. 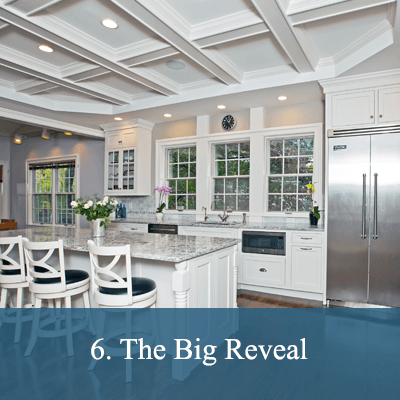 While most clients are eager to start their remodeling project right away. We find that a detailed design and material selection gets us to the finish line faster and with a much better end result. We eliminate the guess work and create a detailed installation packet containing the detailed designs, install notes, pictures and specs of all materials. Materials are ordered and lead times considered prior to scheduling the start date of your project. For example, if your cabinets take 6 weeks to come in and we have 3 weeks worth of prep (demo, framing, rough plumbing, electrical, plaster and flooring) that needs to be done prior, we can start 3 weeks from now. If you have been clipping pictures, making sketches and snapping photos, gather them up, come in, and meet with one of our designers. If you are someone who has trouble deciding what you want, not to worry, our designers are happy to help you define your style and develop your vision. Come visit us at our showroom, explore the possibilities and learn more about how we can help you. You are welcome to stop in but appointments are preferred so we can dedicated our time to you. An experienced member of our Transitions Team will visit your home to take precise measurements, discuss ideas, answer questions and evaluate the scope of your project. The goal of this appointment is to gather the information needed to design the space and get a sense of your style. A follow up Design Appointment should be scheduled at this time. Note: Design work does not start unless you schedule a time to view the work. 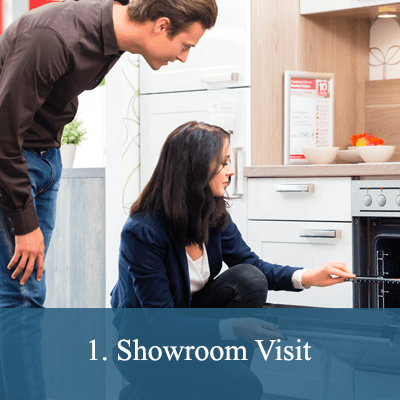 Usually about a week after your first home visit, we are ready to have you come back to our showroom to review preliminary design concepts and start selecting specific materials. 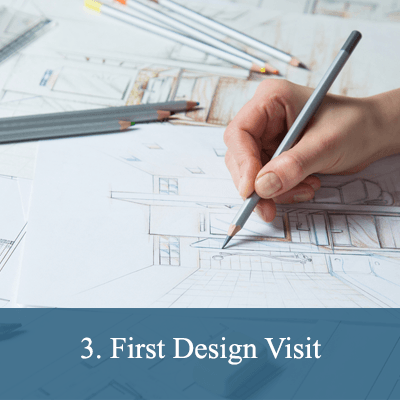 Before you arrive, your designer will have spent many hours hand-selecting a full-range of materials, colors, textures and finishes that will uniquely fulfill your vision for your new space. Ok, so momentum is starting to build! This is when you get to see your dream really start to take shape. 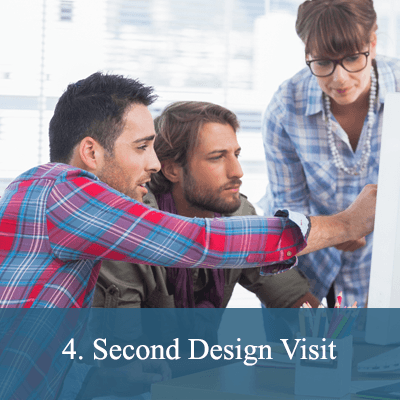 At this meeting you will see an updated 3-D rendering of your design reflecting all of your design choices. During this meeting we will conduct a very detailed review of all products and materials selected. Once we have firmed up all of the design selections we will proceed with a Second Home Visit in order to complete the full construction budget. 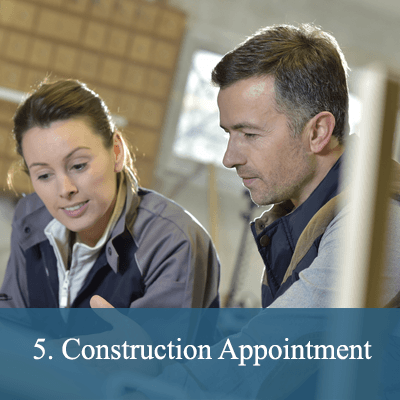 During this appointment we will schedule the Construction Appointment. Getting the right outcome means doing the detailed work of measuring twice, revising concepts, editing the vision and making sure all of the pieces will fit together as planned. We’ll review the final design in your home to expose any obstacles and gather information to price out the Remodeling Portion of your project. Specifically we will be looking at heat, electrical, plumbing, flooring, interior trim, etc. We are methodical and very detailed at the beginning of each project in order to eliminate as many issues or unexpected changes during construction. The final Design, and Proposal presented. This is a very exciting meeting!! You will see your final design, review all of the details of the scope, confirm the time frame and review and sign the contract and schedule a start date. We serve the Greater Boston area, South Shore, and Cape Cod communities such as Hingham, Cohasset, Hanover, Scituate, Marshfield, Norwell and Duxbury, as well as Brookline, Newton, Wellesley, Hull, and Weston. All materials contained in this website are the copyrighted property of Transitions Kitchens and Baths. The materials on this website are for your personal, non-commercial, use only and may not be altered, copied, distributed, downloaded or exploited in any fashion without the prior written consent of Transitions Kitchens and Baths. Kitchen, bathroom, and other home renovation photos by Susan Hagstrom, except where otherwise specified.